Why has CIGIE Reactivated its Disaster Assistance Working Group? In response to the damage caused by Hurricanes Harvey, Irma and Maria, Congress has to date appropriated an additional $26.1 billion to the Disaster Relief Fund. Congress also appropriated $450 million for the U.S. Small Business Administration (SBA) Disaster Loans Program, $7.4 billion in U.S. Department of Housing and Urban Development (HUD) Community Development Block Grants, and $1.27 billion in disaster nutrition assistance to Puerto Rico. The Council of the Inspectors General on Integrity and Efficiency (CIGIE) has therefore reactivated its Disaster Assistance Working Group (DAWG) to coordinate the Federal Inspectors General (IG) community’s oversight efforts of these and any other disaster-related funds. HUD Office of Inspector General (OIG) currently chairs the Audits and Investigations Subgroups of the DAWG, and Department of Homeland Security (DHS) OIG currently chairs the Data Analytics Subgroup. How does the Federal Government help disaster victims? The DHS's Federal Emergency Management Agency (FEMA) coordinates the Federal government's role in preparing for, preventing, mitigating the effects of, responding to, and recovering from all domestic disasters, whether natural or man-made, including acts of terror. The Robert T. Stafford Disaster Relief and Emergency Assistance Act, Public Law 100-707, gives the President the authority to make disaster declarations that allow FEMA and other Federal agencies to provide financial and physical assistance to disaster victims. FEMA offers several disaster assistance programs for individuals and State and local governments, tribes, and certain private non-profit organizations. Besides FEMA, at least 16 other Federal agencies have a role in providing disaster relief and assistance for presidentially declared disasters, including HUD, SBA, the U.S. Department of Health and Human Services (HHS), the U.S. Department of Defense (DOD), the U.S. Environmental Protection Agency (EPA), the U.S. General Services Administration (GSA), the U.S. Department of Justice (DOJ), and the U.S. Government Accountability Office (GAO). All programs offered have specific eligibility requirements that must be met and an application is generally required. What is the Inspector General community’s role in disaster assistance oversight? Disasters, both natural and man-made, provide unique opportunities for fraud, abuse, and mismanagement that would deprive affected individuals the full benefit and use of Federal funds designated for relief and recovery. Congress and the public rely on the Federal IG community and the GAO to be the principal Federal line of defense against such incidents. State and local government audit and investigative organizations also provide a layer of oversight and routinely coordinate with Federal IGs to help ensure that disaster funds are used as intended and according to requirements. Congress, IGs, and GAO also recognize that CIGIE, an organization that includes 73 Federal IGs, plays a critical role in helping to coordinate the IG community’s efforts to oversee the resources appropriated by Congress for disaster recovery programs. This is especially true when the IGs’ work is to be performed in a short timeframe under the complex and extreme conditions typically created by a disaster. The Federal IG community has a long history of facilitating impactful and coordinated oversight of Federal agencies’ disaster relief operations and activities. In 2001, under the umbrella of the Homeland Security Roundtable, the IG community joined forces in an unprecedented manner to coordinate oversight and make recommendations for operational improvements following the 9/11 terrorist attacks. In response to Hurricanes Katrina, Rita and Wilma in 2005, the IG community established the DAWG. Through the DAWG, the IG community provided coordinated oversight of more than $68 billion in resources made available by Congress to aid in 2005 Gulf Coast Hurricane recovery efforts. In response to Superstorm Sandy in 2012, CIGIE reactivated the DAWG so that the IG community could again provide coordinated oversight for the roughly $50 billion that Congress appropriated in the Sandy Recovery Improvement Act. More recently, with the 2017 Hurricanes Harvey, Irma and Maria, the DAWG reactivated to coordinate its work with Federal agencies, the State Auditor of Texas, the State Auditor of Florida, the Comptroller of Puerto Rico, and the National Association of State Auditors, Controllers and Treasures to ensure Federal disaster aid is used as intended. DAWG proactively deployed teams to Texas, Florida and Puerto Rico to deter fraud and assess the states’ and territory’s ability to properly account for and safeguard disaster resources and manage the recovery effort. To read more about the history of CIGIE’s DAWG and the IG community’s efforts to coordinate disaster oversight prior to the creation of Oversight.gov in 2017, please visit IGnet.gov. CIGIE and its disaster oversight coordinating committees also have a long history of working with GAO to leverage resources, eliminate the potential for duplication of effort, and better coordinate responses to major disasters. GAO is an independent, nonpartisan agency that works for Congress and conducts audits and investigations of Federal programs and operations. As the most recent DAWG was formed to coordinate IGs’ oversight of Hurricanes Harvey, Irma, and Maria, GAO’s staff, including its Chief Operating Officer and its Managing Director for Homeland Security and Justice, have begun meeting with DAWG leadership to coordinate GAO’s and the IG community’s disaster oversight efforts. To read about GAO’s work, please visit GAO.gov. Where can I find DAWG and disaster-related OIG reports? To find OIG reports about Federal disaster recovery programs on Oversight.gov, navigate to the Reports page and use the Filter Options to conduct a relevant Keyword search, such as “Hurricane Harvey,” “Hurricane Sandy,” or “Superstorm Sandy,” and to apply additional filters. Please also visit the individual webpages of CIGIE’s member OIGs to find additional, older disaster-related reports. Please note that this Disaster Assistance Working Group page is still being developed, and future versions of the page will present additional options for finding disaster-related OIG reports. Where can recipients of Federal disaster-related funds find “Audit Tips” for managing this money? On behalf of CIGIE, in 2016 the HUD OIG also issued a Special Report on the Disaster Relief Appropriations Act of 2013. HUD OIG reviewed the eight Federal agencies’ spending of $46.5 billion received for expenses related to Superstorm Sandy and other disasters. They also identified common concerns and made suggestions to improve oversight and enhance collaboration, and reported on best practices. This report should be helpful to officials responsible for recovery efforts related to any disaster including Hurricanes Harvey, Irma, and Maria. What guidance has the White House given Federal Departments and Agencies and others about recent disasters? To read the full memorandum, and other guidance and circulars issued by OMB, please visit www.whitehouse.gov/omb/. How do I report suspected Disaster Fraud? 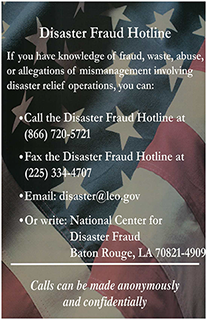 If you have knowledge of fraud, waste, abuse, or allegations of mismanagement involving disaster relief assistance or operations, please contact the IG community’s Disaster Fraud Hotline. Calls can be made anonymously and confidentially.